The last line of the Florence Nightingale Pledge reads, “With loyalty, will I endeavor to aid the physician in his work, and devote myself to the welfare of those committed to my care.” Certainly, Sauk graduate, Sandy Morissey, feels the same as she has always wanted to help others in need. “I always wanted to be in the nursing field,” shared Sandy. When her aging father started to require more care, she knew it was time to go back to college. “I really wanted to be able to take care of my Dad [if he needed me],” she added, and getting her CNA has been a great start. With renewed confidence, Sandy has expressed interest in going back for her LPN degree. 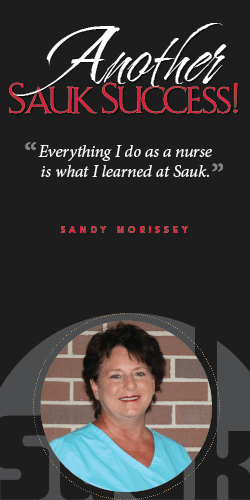 “I really enjoyed [learning] once I got going.” Sandy is Sauk proof that it’s never too late to follow your dreams. Sandy now works part-time for Visiting Angels of Dixon.